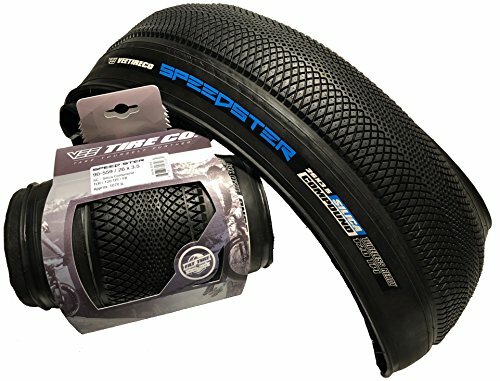 This is a pair of 26x3.5 Fat Tire Speedster bicycle tires. The Fat Bike / Fat Tire version of the Speedster was designed for rolling speed and minimal drag on hard pack or paved terrain. The honeycomb center tread provides virtually zero rolling resistance and unbelievable tread life. The honeycomb feature also gives you excellent traction in dry or wet conditions. Large diamond shaped side knobs provide the grip you need in corners, while the tread knobs get smaller towards the center for the ultimate speed and traction. And with its balloon-style structure, you'll feel like you're floating on air. Vee Tire has been a leading manufacturer of high quality bicycle tires and tubes since 1977. Produced in Thailand, each of their products are carefully crafted with select raw materials using state of the art modern technologies giving Vee Tire a leading edge over the cheaper low cost products on the market. Ride with confidence and Ride Safe with Vee Tire! If you have any questions about this product by Vee -, contact us by completing and submitting the form below. If you are looking for a specif part number, please include it with your message.